Three Institute of Buddhist Studiesâ€™ students received their Master Degrees at Commencement ceremonies on Friday, May 6, 2011 at the Jodo Shinshu Center in Berkeley. The presentations were made by Dr. Leroy Morishiata, Chair of the IBS Board of Trustees. The event was chaired by Rev. Dr. David Matsumoto and began with Opening Service led by Bishop Koshin Ogui, Bishop of the Buddhist Churches of America and President of IBS. Opening remarks were made by Dr. Richard Payne, Dean of the IBS, and Dr. Morishita. The commencement address was presented by Rev. 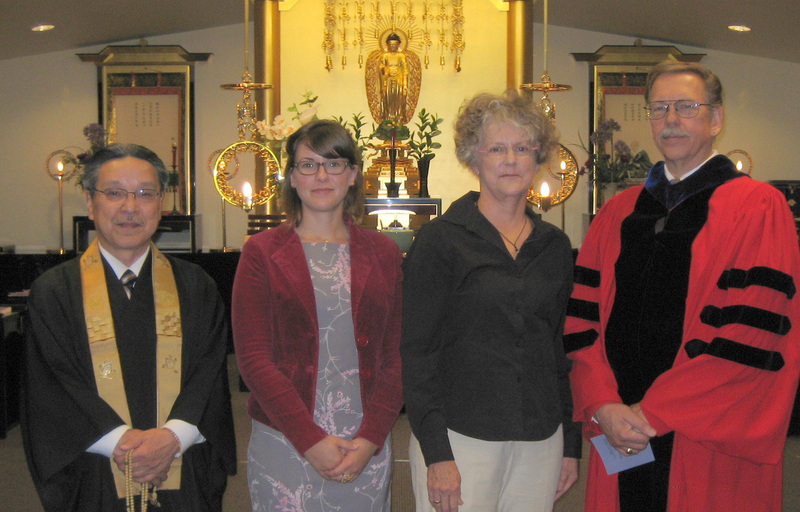 Nobuo Miyaji, Rinban of the Fresno Betsuin Buddhist Temple, who spoke on the importance of Shin Buddhist Education. Takashi Miyaji is currently attending Ryukoku University, Kyoto, in the Department of Shin Buddhist Studies, and Pinto will be attending the University of Southern California and working for her doctorate in the Department of East Asian Studies, Religion, in the fall. Dr.Morishita, representing the IBS Trustees, publically announced the appointment of Dr. Yamaoka as the H.E. Kosho Ohtani Chair for Shin Buddhist Studies. Dr. Yamaoka is a Core Faculty member of the IBS and also a Core Doctoral Faculty member of the Graduate Theological Union.